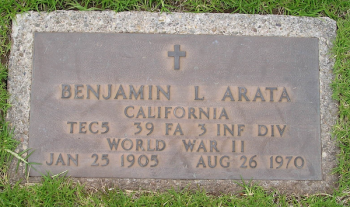 ARATA, Benjamin “Benny” Luther (1905-1970) [SS#563-14-7679], whose grandfather came to Santa Barbara from Genoa, Italy, was a second-generation Santa Barbara native and an Army World War II veteran. Twice married and divorced, Arata suffered from alcoholism. Judge Pier Gherini, Santa Barbara police judge from 1946 through 1951, often sentenced troubled alcoholics to work on the east end of Santa Cruz Island. This not only provided the Gherinis with employees, but also it helped alcoholics in sobering up. Arata was one of them. Arata also worked off and on for 40 years at the Santa Barbara Riding Academy. In August of 1970, Arata died in Santa Barbara at age 65. This page was last edited on 25 January 2016, at 09:09.